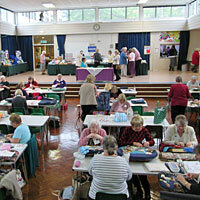 North Downs	Lacemakers was set up in 1980 by a group of local lacemakers, initially meeting in members' homes, and took its name from the area in which they met. As the group expanded other premises were used. The Fritillary was chosen as the group's logo, as it grows wild in the locality. We are a friendly group of lacemakers and welcome members of all ages. Our members include	beginners, teachers and authors who make bobbin and needle lace of all types, traditional and modern. We welcome visitors of any standard of lace making to our meetings. Our programme of monthly meetings includes talks, mini-workshops, 'Make Lace' evenings with suppliers and a Christmas Party. We meet on the second Thursday of each month at the Morgan Centre in Crowthorne from 8:00 to 10:00 p.m. We hold a monthly raffle, and have goods, including membership badges, with our logo on for sale. Members may borrow books from our well stocked Library. We had a very successful exhibition in June 2016 at The Needlework Archive at Greenham. You can see some pictures from the event here. Please join us even if you are a complete novice. Venue: Red Cross Hall, 10 a.m. - 4 p.m.
Speaker - Jan Blight, Topic - Spinning a Yarn. Speaker - Dr. Susan Kay-Williams, Topic - TBC (RSN). Speaker - David Horton, Topic - Grandma flew Spitfires. Speaker - Hamish Brown, Topic - Stalking. Speaker - Colin Parrish, Topic - Queen Victoria's Daughters. Speaker - Ian Head, Topic - History of Money. Speaker - Sally Fisher, Topic - Clivenden and the Astors. Speaker - Deborah Wheeler, Topic - Mend and Make Do.